Starfish Island. 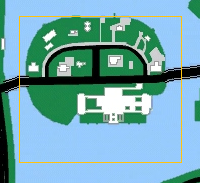 The largest mansion on the far side of the island is Vercetti Estate. Starfish Island in 1986 and 1984. Starfish Island is a large oval-shaped island at the center of Vice City's bay. Located between southern Vice Beach and Vice City Mainland, Starfish Island a wealthy district containing lavish mansions and large estates with swimming pools, large garages, and parked speed boats. There are also two specially-shaped swimming pools in the shape of a Rockstar logo and a bikini clad woman on the island in the yards of two mansions. The Patrol Invest Group provide protection for most of the island's residents while the Vercetti Estate has its own gang for protection (Diaz's Gang and the Vercetti Gang). VCPD officers, however, are seen chasing the Patrol Invest Group guards. The island is home to drug baron Ricardo Diaz until 1986, when is killed in a large shoot-out involving Tommy Vercetti and Lance Vance, who take over the mansion. Starfish Island's design is likely to be inspired by the many real-life residential islands, natural or artificial, that link Miami Beach and mainland Miami, including the Venetian Islands along the Venetian Causeway, and Palm Island, Hibiscus Island, and Star Island adjoining the MacArthur Causeway. This Infernus comes with a normal paint job prior to the mansion's change of owner. After that, it always appears in white, implying that it is owned by Lance Vance. Sea Sparrow at Diaz's mansion, after collecting 80 hidden packages. This page was last modified on 1 June 2015, at 00:27.